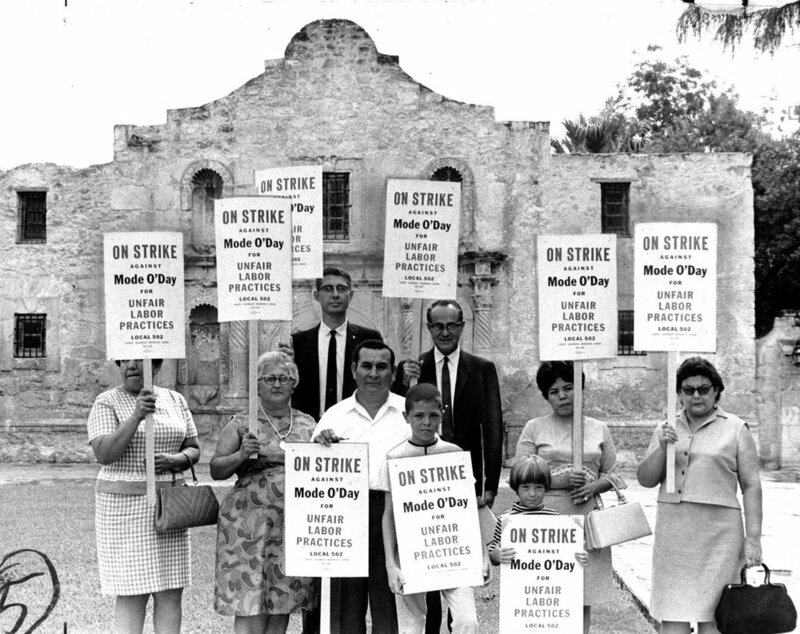 Union members (ILGWU Local 350) picket outside the Alamo, October 1967. Photo courtesy the Kheel Center at Cornell University. In early 1938, the city of San Antonio arrested over a thousand of its residents during what the police chief called a “revolution.” In the city’s hundreds of pecan sheds, a mostly mexicano, mostly female workforce husked the nuts on their way to market for poverty wages. On January 31, after a pay cut by “Pecan King” Julius Seligmann, the shellers up and walked off the job. The strike quickly expanded past union members to include eight thousand workers, and from there to sympathetic community members with no hand in pecans. Economic grievances collided with ethnic ones, igniting unrest throughout the ramshackle barrios. The city’s political machine responded with brute force, sending riot-geared police to club the shellers and their supporters on the picket line. Police dropped some protestors off miles outside town and sprayed overcrowded jail cells with firehoses. Two months later, when Seligmann caved to most demands, as many as twenty-five thousand attended a raucous victory dance. So opens Max Krochmal’s history Blue Texas; thereafter, Krochmal writes, “politics in Texas would never be the same.” The upheaval among the pecan strikers built bridges across ethnic lines with some Anglo labor organizers, and later with Black civil rights activists in San Antonio’s East Side. To the southeast, a particularly active chapter of the NAACP in Houston pushed civil rights causes, while civil rights unionists fought simultaneously for economic gains for Black workers and for the integration of labor unions. Later, these organizers joined with White liberals to commandeer the county’s Democratic Party apparatus. Over the ensuing three decades, by fits and starts, a coalition would form of African-American community activists, Mexican-American community activists, White labor activists, and independent White liberals, leading to gains in civil and workers’ rights and occasional electoral victories. The collaborations changed the face of Texas and redrew political battle lines in the state and nation. Krochmal, a professor at Texas Christian University, traces the process in painstaking detail. His account picks up in the late 1930s and winds through the mid-1960s; its drama traverses the state, from Dixie-ish East Texas to the Rio Grande Valley in the South, from the scrub of West Texas to the statehouse in Austin. Over that time, liberal activists organized direct actions, litigated, and worked toward electoral gains; often, those strategies intersected. Krochmal comes to believe that radical activism—more principle and less realpolitik—is effective, and the moderates be damned. But the procedural drama and the meandering road that social progress took serve to underscore another fundamental thrust of Krochmal’s text: that democracy is not a finished thing. It’s a process. In 1965, after the rest of the state had integrated and the climactic statewide Democratic Coalition was on its last legs, student-led sit-ins in Huntsville belatedly integrated the city’s establishments, overcoming both segregationist Whites and more conservative Black leadership. But Krochmal’s interstitial descriptions of organizing and the attendant kerfuffles does much of the text’s pointed work. The history is more complicated than hindsight tends to suggest, Krochmal stresses: there was rarely any such thing as complete intraracial solidarity, as some elites within the Black and Brown communities pooh-poohed more aggressive tactics and accepted gradualism and patronage appointments instead. Meanwhile, the interracial coalitions that formed and fell apart repeatedly were also conflicted, especially as White folks tried to harness the voting power of Black and Brown communities while often ignoring their calls for true independent political voice. But most of the work to unite progressive causes came from inspired grassroots activists. Moses LeRoy, a Houston train porter and tireless civil rights unionist, appears time and again in Blue Texas alongside his wife Erma LeRoy, herself active in the NAACP and a champion voter registrant. Moses described segregation in the early 1940s as also “an economic problem:” the marginalization of non-White workers allowed for underpaying White workers too, and in turn White workers could be conscripted in the continued oppression of non-White workers with the old “at least you don’t have it as bad as them” line of reasoning. Thus did class oppression feed racial oppression and vice versa. Moses was uniquely positioned to fight both at once, as he was sidelined into a segregated, mostly voiceless Black auxiliary of his Brotherhood of Steamship and Railway Clerks. From within and without, thanks to Black civil rights unionists like Moses LeRoy and to the activism of Mexican-American organizations, unions began courting non-White allies. In 1944, when the Supreme Court struck down the all-White primary—which had theretofore undercut the Black vote—in a case brought by the Houston NAACP, labor began to warm to civil rights causes. As Black Americans’ ballot-box power grew, their struggle became of greater interest to groups that wanted to win elections. In San Antonio, ballot box considerations also helped to knit a countywide coalition. In the mid-’50s, do-everything activist Albert Peña and the independent Henry B. Gonzalez used offices on the city council and in the state senate to advocate for Black civil rights, winning over Black voters and intertwining Black and Brown political causes in the city. Then, in 1959, when mexicana garment workers walked off the job at Tex-Son garment factory, the Texas State AFL-CIO supported the strikers for years, until there were only thirteen strikers left and the factory closed. Across town, Hank Brown, a white plumber and labor leader, led a simultaneous strike against the conditions that conspired to make San Antonio a “low-wage town.” Among them, he believed, was the “overabundance of cheap labor that normally is available—Latin-American, primarily.” Instead of demonizing the Latin-American workers, Brown urged common cause: “the solution to all of this is the organization of the Latin-American people,” because “everybody has a right to make a decent living.” Such support tied labor into the burgeoning coalition as well. And as went San Antonio, so went the state. Despite constant reactionary pushback, the reformers were able to win major gains, pushing the Democratic party in a more liberal direction (though ultimately ceding control of the state to Republicans), electing liberal Yarborough to the U.S. Senate, making Henry B. Gonzalez the state’s first Mexican-American congressman, integrating public and private facilities, and hugely expanding Black and Brown political power. Through a combination of direct action and electoral maneuvering, these obstacles to full citizenship were eroded. And while Krochmal (rightly) criticizes the “unconscious white supremacy” of White liberals, the hard-nosed pragmatism of organized labor, and the recalcitrance of Black and Brown elites, their frustrating tendencies are too part of the democratic whole, even as they impede progress toward its most robust form. History did not push Texas into a more just alignment; the state was prodded and argued there with great effort at every turn. Today, progressives organizing in Texas still face significant obstacles: state laws prohibit municipalities from raising the minimum wage above the federal $7.50, and the legislature is fighting hard for voting restrictions that will inordinately affect non-White and poor voters. Right-to-work laws, now as then, limit the reach of labor in the state. So Krochmal’s coalition looks similar to the one that progressives hope to recreate today, even as, he dismissively writes, “self-styled activists have failed to find the methods necessary to transcend the deep divides that separate us.” Obviously, such methods are key; but with labor much reduced from its halcyon days, it is unclear where the connective tissue will now come from. It is much more effective, after all, to ask someone to vote in her own perceived self-interest than to vote with her conscience. Still, as hazy historical nostalgia became a political cudgel in last year’s election, remembering clearly and exactingly is itself a political act, resisting the reduction of the past into a simple fable. Krochmal’s narrative fills in the nitty-gritty of history’s movement: the tireless pounding of pavement, the weeks and months crisscrossing the state to rally support, the compromises and refusals, and the men and women made great by historical circumstance, elevated by their work for the common good to broaden who counts in Texas politics.